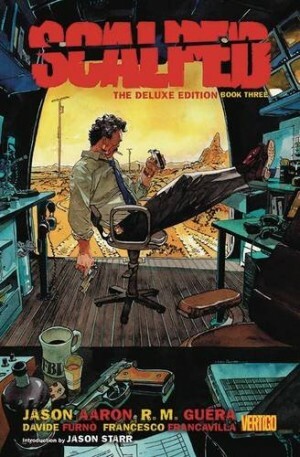 The Scalped Deluxe Edition Book 5 holds within its covers the closing volumes, Knuckle Up and Trail’s End, of Jason Aaron and R.M. Guéra’s flint edged sucker punching crime thriller, and D-A-M-N it’s one heck of finale. Events in Scalped pivot on two violent murders committed on the Prairie Rose Indian Reservation, South Dakota. One occurred in the 1970s and has driven FBI Agent Baylor Nitz hell-for-leather to take down the man he believes responsible, gangster Chief Lincoln Red Crow. The other occurred in the present. Gina Bad Horse was many things to many people, not least mother to undercover agent Dashiell Bad Horse who is working for both Nitz and Red Crow. Gina’s death has set Red Crow on the seeker’s path, caught between consolidating his criminal influence and seeking redemption. The mystic Catcher was once a Rhodes scholar, now he’s a drunk who is convinced the ancient Thunder Beings have given him a sacred quest. Other people have been drawn into their wake. Granny Poor Bear is a medicine woman offering redemption to Red Crow and his wayward daughter Carol. Carol is trying to pick up the pieces of her life and leave her behind her addictions – crack cocaine and Dashiell. Officer Falls Down is the only honest cop on the Rez, tasked with tracking down Gina’s killer. It’s brought him closer than he would like, but now he and Dash know who it is. Meanwhile, teenage single father Dino Poor Bear longs for a better life for both him and his daughter, but anger and desperation have blinded him and sent him down a dark path. Every player on the board has made a choice, for good or ill. Now they will reap the consequences of those actions or find redemption as paths converge for bloody retribution. 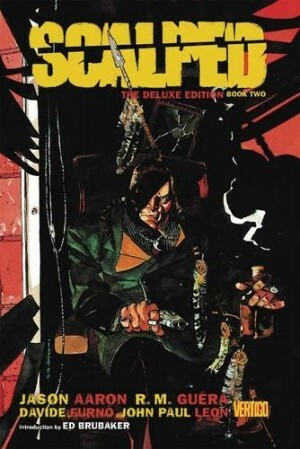 Scalped is Aaron’s pot of stew. He’s added all the components, followed the steps and set it to a slow simmer. Ten books later, or five Deluxe Editions, we have a superb story that’s a roller coaster of gut wrenching emotions and harsh violence. The artistic show belongs without doubt to Guéra who has added depths of atmosphere with what is truly outstanding work. A number of noteworthy guest artists have contributed throughout the series, including artist Jock who provided the fantastic cover art. 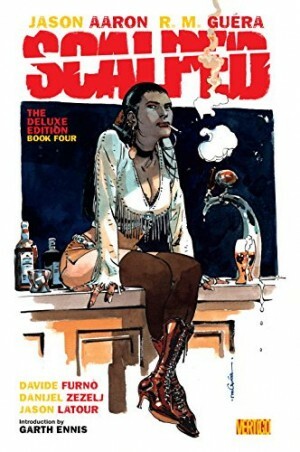 Short story ‘The Art of Scalping’ features Brendan McCarthy, award winning Jill Thompson and the late Steve Dillon, among others. If any artist has appeared sub-standard during the course of the series, it’s not because they were bad, but because they had to follow Guéra. His grimy settings and evocative use of shadows and colours to contrast each other renders an environment that ranges from plush interiors to bone dry deserts. 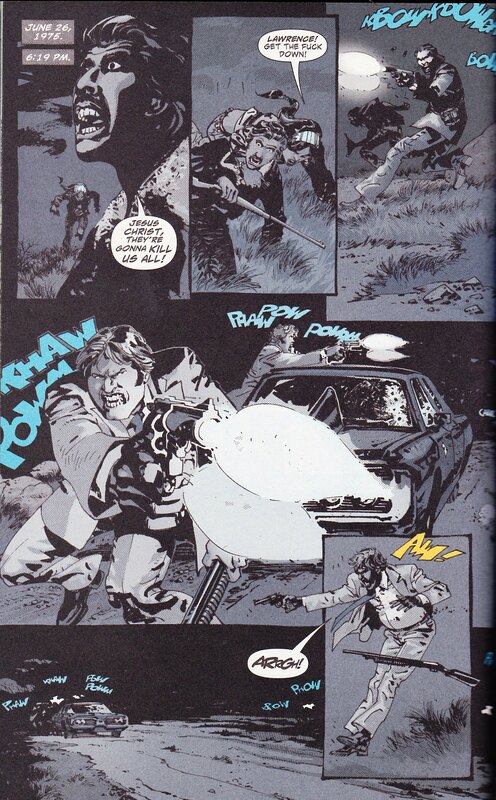 His fight scenes include bloody knife fights, brutal punch-ups and visceral shoot outs. Death is never far away on the Rez, Guéra certainly making you believe it’s just over the page. Extras include a character study sketchbook, highlighting the immense amount of researchundertaken to add realism to his cast. Even when Aaron hit a bum note his writing has been of a consistently high quality, finishing on a peak. 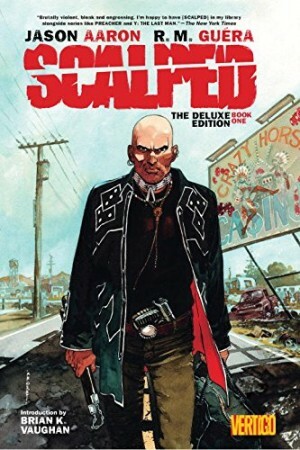 In a market saturated with supers, Scalped is a satisfying read thanks to rich and multi-faceted characters within a killer plot. Beginning to end it is a compelling and gritty top class crime noir thriller. 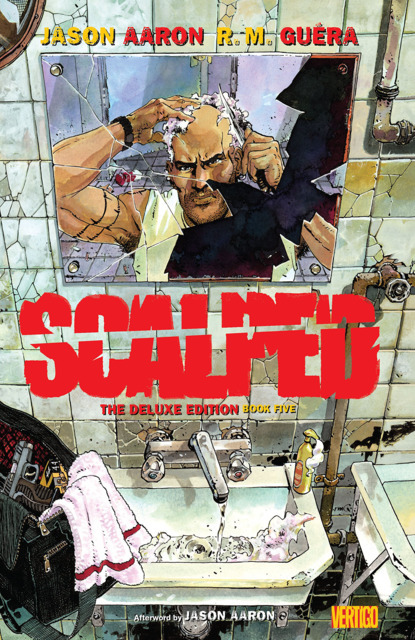 Whatever Scandi-Noir TV show or crime novel you’re gripped by, Scalped is equally good. Both the hard copy and digital edition heighten the experience exponentially, making it well worth the investment on any platform.